Richad joined Société Générale in 1994. Until 2002, he built an equity capital markets expertise through various senior positions covering clients in France, South East Asia and Northern Europe. In 2003, he joined Société Générale bond syndication department to head-up the private placement activity of the bank, which he developed and expanded as a leading platform in various products and geographies, with a particular focus on emerging markets currencies. From 2009, Richad was Head of Global Capital Markets, overseeing the CEEMEA region for Société Générale Corporate &Investment Banking. In October 2013, Richad was appointed Group Chief Region Officer for the Middle East and Chief Executive Officer of Société Générale Dubai. 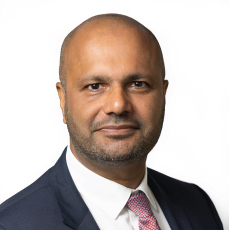 By capitalizing on Corporate & Investment Banking, Private Banking and Securities Services activities in the region and thanks to his 20 years of experience in capital markets, Richad Soundardjee aims to further develop Société Générale’s businesses and presence in the Middle-East and in the Gulf countries in particular. Richad Soundardjee holds an MSc in International Finance from HEC, a degree from the French National Institute of Telecommunications and a Master of Management degree from Paris Dauphine University.